I have just been looking at census numbers and estimates of religous numbers from an excellent web site called adherents.com . Now remeber that the Modern Spiritualist movement started in 1848. The first lecture about spiritual philosophy, and especially of the marvellous circumstances which heralded in the spiritual dispensation of the nineteenth century, was delivered at the Stuyvesant Institute, Broadway, New York City, in November, 1850, by the Rev. S. B. Britain, better known in the American Spiritual ranks as Professor Britain. Already by 1855 had many millons of followers in the USA. By 1856 Uriah Clark had founded a regular publication the Spiritualist Register with listings of hundreds of speakers and mediums. the world wide growth was huge from then into teh early 20th Century. Well I have just done a run round the latest census numbers. In the last census here less than 10,000 of Australia's population acknowledged they were Spiritualists less than 0.1% of the total population of 19.9 million. In Canada we do not rate a mention as there are less than 20,000, in a population of 29.6 Million. The adherents web site indicates that, for 2004, in the USA out of a population of 224.4 million there were some estimated 163,710 Spiritualists so around the same percentage as Oz and Canada. In the UK 32,000 out of 57.1 million again a consistent percentage of population. So taking Oz, Canada, UK and USA we are about 220,000 out of 331 million. However remember that at about the same time Spiritism was formed following the teachings of Allan Kardec. So what is a worls wide estimate, when not unnaturally we are lumped in with that body. In fact it is startlingly estimated that there are a combined 15 million adherents world wide. So we are the little brother to Spiritism now. Over 10 million of these Spiritists are in Brazil, indeed recent estimates put this at 15 million with up to 50 million more loosely following it(this would be in line with my discussions with a young Spiritist from Brazil, now attending our Mission, who indicates it is seen as a mainstream cross over from Catholicism to the indigenous and African religions. I note this lovely quote in Adherents "There are said to be about half a million active mediums and shamans [of magic spiritism, incl. Umbanda & Macumba], 15 million professed members, and according to some, a fringe following of up to 50 million, nearly half the population of [Brazil]." Admittedly at the extreme I think the fringe following of 50 million may have little to do with Spiritism and more with Voodoo which is also, accordiing to this young man an aceepted and active "religion" in Brazil. However there is no doubt it is a very powerful movement in Brazil. I understand that the estimate of the USA numbers may well be excessive from the 9+ million in the 1880's I believe the National Spiritual Association of Churches probably cannot muster more than 8,000 members (if that) and less than 100 churches. Now there are other associations in the United States so there will be more and I understand there are Spiritualists who have no nearby churches to attend so the numbers are higher than just the NSAC but it may appear much less than my 163,710. Hmm in the UK the 2001 census revealed there were 390,000 Jedis (Jedi Knights), That is Seven people in every thousand in England and Wales gave their religion as 'Jedi' in the 2001 Census. In Australia 2001 70,000 Jedi were recorded. the hoaxers did better than us. For Interest in oz Pagan and Wiccan come together under the pagan alliance. Put these together in the UK you get 38,000 more than the number of Spiritualists and 26,727 in Australia almost 3 time the Spiritualist numbers. Still a tiny proprtion of a population where it appears an increasing proportion believe in life after death a percentage well above the numbers of Spiritualists. Have we suceeded too well in convincing peopel or is it just so many celebrity mediums are not Spiritualists so the relevance of our movement is lost. Quality Mediumship seems the only sure route, attracting folk of the highest motives. hiorta wrote: Quality Mediumship seems the only sure route, attracting folk of the highest motives. I love what it did for me in my time of need but reluctantly I have accepted it is unlikely to do the same for others younger than me. Most of those I learned from in my early days were older than me and many have since passed over. We're a dieing bunch of crinklies, myself included. I'd love to be proven wrong but I feel that I caught the tail-end of our movement as it withers away. At the same time I may be seeing the beginnings of whatever may emerge as a successor, for better or for worse. Thus far I'm not optimistic. I believe Spiritualism can not appeal to the two or three generations brought up in the modern technological world. Its language and methods are archaic, even for me, a wholehearted devotee. As Spiritualists we speak mostly of the past, of the mediums and mediumship of yesteryear. Historical and largely irrelevant. Not irrelevant to the unchanging truth may I add but irrelevant to those who are living in the present and for whom those distant times mean little. The need for accomplished mediumship would be just one small part of what Spiritualism needs to ever be taken seriously again. But even more than that is needed and with sadness I see how the mystical, the fantastical is much more appealing to today's generations. Channelling appears to be replacing mediumship. So-called Ascended Masters appear to personally 'bring the word' on a personal basis rather than in the way that the teachings of guides such as Silver Birch were brought to the masses. Reiki is replacing spiritual healing. We don't have a whole lot left to offer. Spiritualism always put the attempts to show the Truths of Life at the forefront of their approach, bringing much peace and happiness to beneficiaries of their gained knowledge to many. It also attracted groups like those whom Silveer Birch became the spokesperson. New approaches would continue to be tried I'd imagine, if it helped to reach the Spiritually needy, so all the well organised groups will have a plan as effective as their earlier successes. hiorta wrote: Spiritualism always put the attempts to show the Truths of Life at the forefront of their approach, bringing much peace and happiness to beneficiaries of their gained knowledge to many. Modern Spiritualism does not have any monopoly on truth and information and unless they can be presented in ways which attracts new adherents, other movements may present them in ways which do appeal. I totally accept that in the past the movement has helped enormously those seeking direction and comfort - I'd love for that to continue but from the many members I engage with on websites other than this, the impression they give me is that they're more attracted by modern ways of presentation. You were right, though, in originally pointing out the importance of sound mediumship because without it our own movement has little more than history and theory to offer seekers. I'd be happy to see the "new approaches" for the spiritually needy but I struggle to see which "....well organised groups will have a plan as effective as their earlier successes." Which groups? What plans? A little over 1 in 5 for the USA rising to a little over 1 in 4 in the UK. I believe more recent studies may give higher levels. Therefore there are many out there who believe in this but we do not see or reach them as a movement. 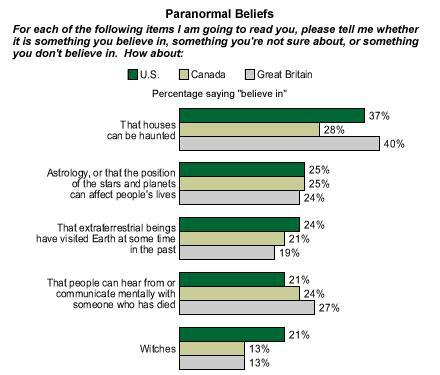 ".....look at the percentage who believed in the ability to communicate with the dead "
Impressive but it would need a big effort to turn even a small fraction of these believers into Modern Spiritualists.... Polls may be general indicators but as with all of them, the actual wording of the question(s) asked can greatly influence the results obtained. Judging by the number of people and friends I have asked recently,whether they believe in spiritualism,on a small average I would say there were more 'no's' than 'yes's'. My own opinion is spiritualism is decreasing not increasing. It may depend what you mean by 'spiritualism'. I don't find spiritualism at all convincing as a religion however in the past it seems to me that many mediums have provided what appears to be very good evidence of survival and I think few people would seriously object to many of the tenets of spiritualism (if they knew what they were). Some of the mediums I am thinking of would describe themselves as spiritualists in a religious sense and perhaps others wouldn't. Mind,I would say today that mediums are not of the calibre that they used to be. I think there is no doubt that the old movement of Spiritualism is presently in decline. That may change, things may improve or it may be an ongoing decline that results in the movement eventually disappear from view. I see myself a Modern Spiritualist and I don’t see that changing – but who knows? What I learned at the time I found it out 25 years ago, was a revelation for me. It changed my life and my outlook totally. At that time there was no Internet, no World Wide Web allowing me to ‘speak’ to folks across the world. I had fewer sources of information, fewer influences, than there are now. If all that happened to me then had happened over the past several years, maybe I’d've become one of the unsatisfied enquirers I ‘meet’ on forum boards? It’s anyone’s guess…. Of late I’ve realised that many I’ve ‘spoken’ to in online forums have been less than impressed by what Spiritualism has on offer. I think they’re right to feel that. Fings ain’t wot they used to be and the fundamental of communication through mediumship is seen much less than it used to be (I think I’m right in drawing that conclusion). Without convincing evidence – personal or not – then I understand why folks feel as they do. Many do not understand anything at all about Spiritualism and the things that convinced me 25 years seem no longer to impress most of those I speak. That used to trouble me but I’ve accepted that a new movement is needed, something modern for the current generation and for generations to come. How this will pan out I don’t have a clue but change is in the air. I’m one of a dieing band and I hope I’ll see the beginnings of what is to follow. How long it will take is guesswork – we’ll see. Whatever comes next will face challenges unlike those that Modern Spiritualism faced when it started. It’s a different world with different expectations. If nothing else it will be fascinating to see how these challenges are met by our unseen friends in the world of the spirit. Ha! You got a good point,Mac. How are the world of spirit handling this siruation? Are they providing more proof? I can't see the fault from the spirit world but back to basics again,we need good mediums. "....but back to basics again,we need good mediums." We don't know what kick-started events eventually leading to the movement known as Modern Spiritualism. It's arguable that those who oversee our contact with the world of the spirit, and vice versa, determined that the time was right and set the wheels in motion. Perhaps it was simply the next stage of a process set in train much farther back? Whether there were many more potential evidential mediums in the world at that time, or simply that more use was made of them, we can only speculate upon. Evidential mediums, though, can only be effective if their spirit-side counterparts are active - and we don't have a clue how that's organised. 'Teaching' mediums can only bring the guidance of spiritually evolved teachers if those teachers are there to work with them, as for example, Maurice Barbanell and Silver Birch. Perhaps we do have plenty of potentially good mediums but they're just not being used to their full potential? I'd say that it's also arguable that the currently low level of activity has come about because those same overseers have decided that it is now right for change. Why not? The world has changed, many generations have come and gone since the early days of Modern Spiritualism, the message of survival et al is out there in the larger community, recorded in countless pages of information. Maybe everything's been done that way as it's reasonably possible to do? More printed material won't make much difference. We know all the fundamental stuff, about survival, about what happens after we pass over, a little about the prospect/possibility of further lives. So now what - what comes next? The electronic media age! I wonder how 'the word' will be conveyed in the new generations which follow? We can only guess what's in store - I wonder how many anticipated the way that the Hydesville rappings would turn into the Spiritualist movement of the past century and a half? You've covered quite a lot there,Mac,coming from the past to the present. Maybe I am wrong but have we progressed? Have we progressed from the 'trumpets and ectoplasm'? Do we really know what is going on within the world of science? Do they consider spiritualism is a world wide cause for present and future investigation? Don't you think that spirit if they really wanted us to know what it is like in their plane,wouldn't they encourage and help us? As you said,surely there must be more evidential mediums around and if there are,why aren't they taken more interest in spreading the word? So many questions to ask and I appreciate from what I have read,that communication is difficult between the two worlds. I often wonder why communication is so difficult and why only some people have this certain gift for contact. Now there is another point. Why do only certain people have this gift? Why don't we all have it? "Have we progressed from the 'trumpets and ectoplasm'? As you said,surely there must be more evidential mediums around and if there are,why aren't they taken more interest in spreading the word?" Trumpets and ectoplasm? Not important unless they bring the message of survival - maybe their production is more of a distraction than the phenomena are worth? Our unseen spirit friends wanting us to know about conditions where they live etc? All been done, all the info. you could use. Help and encourage us? Same again. It's a hiatus, a time between what was and what will be. The New Agers are kinda filling the space with their stuff for the moment. It remains to be seen if theirs is truly the message that might move the world a teeny, weeny step forward. Evidential mediums still have their place but that place is a smaller, less important one than it used to be a few decades back. Follow the long road ahead.......but still keep getting nowhere.